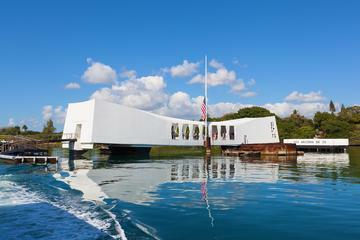 Taking a Pearl Harbor tour on Oahu is one of the best ways for you to view all of the iconic sites on the island. These tours are unique and will relay more than just interesting facts about December 7, 1941. Tours will take to you to the famed USS Arizona Memorial and the legendary battleship USS Missouri where the final war treaty was signed. Other spectacular attractions you can experience include the Pacific Aviation Museum and the USS Bowfin Submarine and Museum. Some tours include a drive through historic Honolulu City to view sites like the ‘lolani Palace, the King Kamehameha statue as well as the world class surfing beaches of the North Shore. No matter which tour you select, you will be pleased with the adventure of viewing of the most iconic spots on the island of Oahu. The USS Missouri Arizona Memorial- and Punchbowl Day Tour is one of the best Pearl Harbor tours which put you in the front of line for all of your entry points. Your seven-hour tour begins with complimentary coach pickup from your Waikiki hotel. 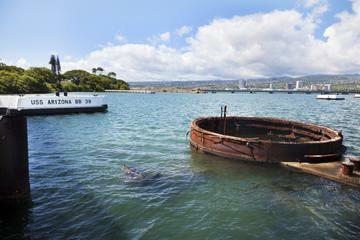 Your first stop will be the exciting and sobering attractions at Pearl Harbor. Once at the Pearl Harbor Visitors Center you will enter immediately with VIP tickets. After the center, you will take a Navy launch across the harbor to the USS Arizona Memorial and from here you will enjoy a guided tour of the battleship, USS Missouri where the final treaty was signed to end World War II. Once you are full of World War II knowledge, you will take a ride through historic Honolulu City where you will view such iconic spots as the Kawaiahao Church, lolani Palace, Honolulu Hale and even a statue of King Kamehameha. The last feature of your tour is a view of the National Memorial Cemetery of the Pacific at Punchbowl. Your tour ends with a complimentary drop-off to your Waikiki hotel. When you are looking for an introduction to the importance of Pearl Harbor, the Arizona Memorial-Pearl Harbor and Punchbowl Day Sightseeing Tour is the perfect tour for you. 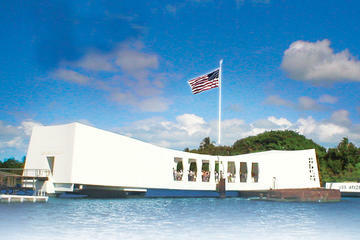 Your five-hour (half day) Pearl Harbor tour starts with complimentary coach pickup from your selected Waikiki hotel. Once at the Pearl Harbor Visitors Center you will enter without waiting and view a historic movie of the events that took place on December 7, 1941. From here you will take a short ride on a Navy launch to the famed USS Arizona Memorial where your guide will explain interesting facts about World War II in the Pacific Theater. Your final portion of this tour will take you by coach to some of the most historic buildings and sites in Honolulu City including the National Memorial Cemetery of the Pacific at Punchbowl. Your tour ends with a complimentary drop-off at your Waikiki hotel. The Honolulu Sightseeing Tour including Pearl Harbor and USS Arizona Memorial Tour is ideal for the first-time visitor to Oahu. Your five-hour (half day) Pearl Harbor tour begins with hopping on a double-decker bus from selected pickup points in Waikiki. The first stop of your tour is at the Pearl Harbor Visitors Center where you will take a guided walk through of the museum. Then you will take a short boat ride across the harbor to the USS Arizona Memorial where you learn more interesting facts about World War II in the Pacific. From here you will ride the double-decker bus to view such iconic sites in Honolulu City like the National Memorial Cemetery of the Pacific at Punchbowl, the King Kamehameha statue and the Mission Houses Museum. Your tour ends with a complimentary drop-off at several locations within Waikiki. The World War II Pearl Harbor Heroes Adventure Tour is the best tour of Oahu for travelers seeking to see and learn all the aspects of this war torn area. 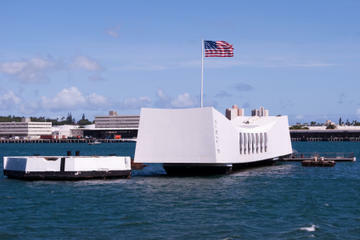 Your ten-hour Pearl Harbor tour begins with complimentary pickup service by coach at your Waikiki hotel. You will then be driven to the Pearl Harbor Visitors Center will knowledgeable guides will walk you through the center, while adding interesting facts to the several multimedia exhibits. Your tour includes a short boat ride to the USS Arizona Memorial where you view one of the most sobering monuments in the USA. You will then take an audio tour of the USS Bowfin Submarine and view the museum which contains numerous underwater warfare craft that has been used from the 1800s to present-day. Next you will take an interesting walk through the Pacific Aviation Museum which houses all of the airplanes used in the Pacific Theater of World War II. Lastly you will have a memorial experience while walking through the mighty battleship, the USS Missouri where the final strokes of a pen ended the fighting of World War II. Your tour concludes with complimentary drop-off service to your Waikiki hotel. The Pearl Harbor Tour from Waikiki is the ideal half-day tour that will allow you to enjoy the sites in a small group with comfort and without waiting. This five-hour tour begins with complimentary chauffeured-style pickup service from your Waikiki hotel. 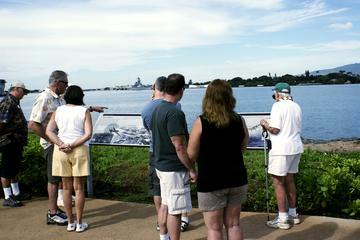 Your first stop will be at the Pearl Harbor Visitors Center where you enjoy front-of-the-line entry access. Once inside you will view the museum and take a short boat ride to the USS Arizona Memorial where you will view several multimedia exhibits that explain the events of December 7, 1941. After an in-depth viewing of Pearl Harbor your chauffeured-style vehicle will take you through some of the historic sites within Honolulu City. You will visit such iconic spots as ‘lolani Palace, the statue of King Kamehameha, Washington Place and the Hawaii State Capitol. Your tour ends with complimentary drop-service to your Waikiki hotel. 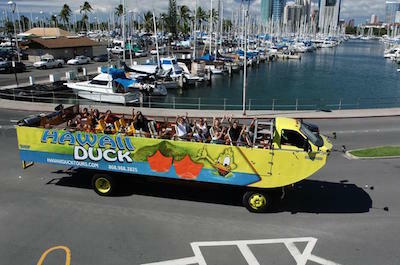 The Pearl Harbor sightseeing and Honolulu Duck Tour is the perfect event for those seeking to travel on an amphibious vehicle for some great sightseeing. Your six-hour tour starts with meeting your tour group at llikai Hotel where you will board on of the most unusual sightseeing vehicles on the island of Oahu, a converting military amphibious craft. Your you then be taken to Ala Moana Center, which is largest shopping complex in Hawaii and to Kewalo Basin to experience Hawaii’s commercial fishing docks. Next, you will view ‘lolani Palace where the last of Hawaii’s monarchy called home and a statue of King Kamehameha. You will see the bustling streets of Chinatown before entering Keehi Lagoon in your amphibious vehicle. 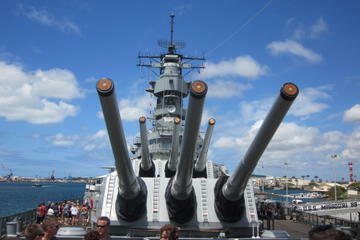 As you pass through Honolulu Harbor your guides will point out Diamond Head, Sand Island Joint-Base Pearl Harbor-Hickam. You will then be dropped off at the Pearl Harbor Visitors Center where you will have your choice of one of three tours which include the USS Arizona Memorial, the Battleship USS Missouri or entry to the Pacific Aviation Museum. Your final stop will where your tour began at the llakai Hotel in Waikiki. The Pearl Harbor USS Arizona and Circle Island Day Trip Tour is a must do tour for people looking to view all of the sites on the island of Oahu. This ten-hour Pearl Harbor tour begins with complimentary pickup service at selected Waikiki hotels. Next, you will be driven to the Pearl Harbor Visitors Center where you will learn many different interesting facts about World War II in the Pacific. You then take a ride on a Navy launch to the iconic USS Arizona Memorial. Once there you will take an audio tour of the memorial where some 1,100 military personnel are entombed forever. Hop back aboard the coach and take a splendid ride around Oahu where you will view the famous surfing beaches of the North Shore, Nu’uanu Pali Lookout, the Byodo-Temple and your last stop will be the spacious lands of the Dole Pineapple Plantation. Your tour ends with free drop-off service at selected Waikiki hotels. 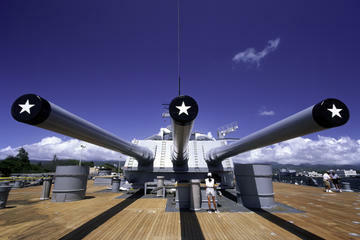 The Oahu Shore Excursion-Pearl Harbor and Honolulu City Tour is the ideal tour for traveler’s arriving by cruise ship. Your seven-hour Pearl Harbor tour begins with complimentary pickup service at your ship’s pier. 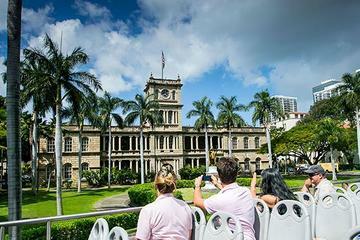 From there you will be driven through historic Honolulu City where you will disembark and walk through ‘lolani Palace which is the opulent residence of Hawaii’s Monarchy. Then you will be driven to view other sites such as Diamond Head, Puowaina Crater, the statue of King Kamehameha and the very emotional National Memorial Cemetery of the Pacific at Punchbowl. Next you will be taken to Pearl Harbor to walk through the USS Arizona Memorial and experience of the history of World War II in the Pacific. Your tour ends with a complimentary drop-off in Waikiki. This tour is limited to specific cruise line passengers. 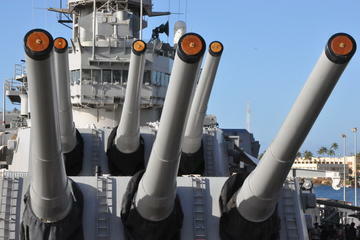 The Battleships Tour of Oahu is a wonderful Pearl Harbor tour which brings history to life for travelers. This seven-hour tour starts with a complimentary pickup at your Waikiki hotel, where you will travel by coach to the Pearl Harbor Visitors Center. 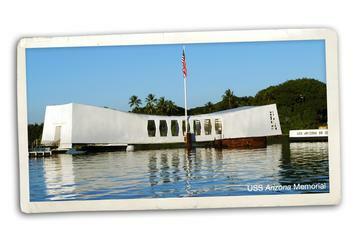 Here you will take an audio tour of the center as well as view a documentary on December 7, 1941. 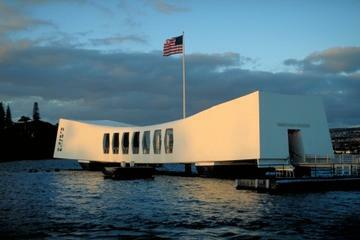 Then you will take a short boat ride to the USS Arizona Memorial to view this historic monument. After this you will be taken to the USS Missouri where the final strokes of a pen ended World War II for a full inspection of this grand battleship. You will then be taken to the USS Oklahoma Memorial to experience more multimedia exhibits. Once you are finished with this part of the tour, you will take a short ride to view the National Memorial Cemetery of the Pacific at Punchbowl. There is no formal lunch on this tour but you will have plenty of time to snack while at the Pearl Harbor Visitors Center. Your tour ends with a complimentary drop-off at your Waikiki hotel. The Oahu and Sightseeing Tour from Waikiki is an ideal Pearl Harbor tour for travelers that want to see everything the island of Oahu has to offer. This ten-hour tour begins with complimentary pickup from most Waikiki hotels. Your first stop will be the Pearl Harbor Visitors Center where you enjoy a short movie of the Japanese attack and a short boat ride to the USS Arizona Memorial. Your next stop will be start sightseeing the island of Oahu on an air conditioned coach. You will travel to the famed North Shore and visit the Dole Pineapple Planation, from where you will visit some of the world’s best surfing beaches like Waimea Bay, Sunset and Pipeline. You can expect a short break at this time for you to purchase lunch. 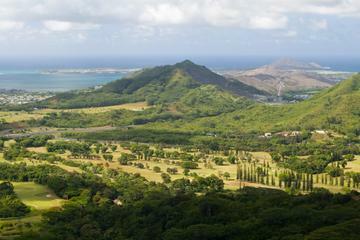 Then you will travel inland and visit Nu’uanu Pali for panoramic views of Kanehoe and Kailua Bay. After descending the mountains you will have an opportunity to take photographs of Hanauma Bay and the Halona Blowhole. Your tour ends with a complimentary drop-off at your Waikiki hotel. The Pearl Harbor Visitor Center Tour is an ideal choice for families looking for an excellent half-day tour that is approved by the National Park Service. Your three-hour tour begins at the Pearl Harbor Visitors Center where you will embark on a self-guided audio tour. From here you will take a boat ride to visit the USS Arizona Memorial where you will find two more museums of excellent multimedia exhibits for people of all ages. You will stroll down Battleship Row until you are ready to enter the USS Bowfin Submarine Museum and Park where you will learn a plethora of information on underwater warfare from its inception in the 1800s to present-day nuclear submarines. You will also have a chance to walk through the famed USS Bowfin Submarine which is the most highly decorated submarine in US Military history. Your tour ends at the Pearl Harbor Visitors Center, where you started. The USS Bowfin Submarine Museum and Park Tour is the perfect Pearl Harbor tour for individuals seeking more information about undersea warfare. This one-hour tour starts directly at the Pearl Harbor Visitors Center, where you will go on a self-guided audio tour of the Submarine Museum which highlights underwater warfare from its inception in the 1800s to World War I to World War II and finally to present-day nuclear submarines. 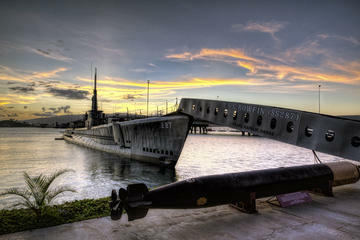 The second portion of your tour will be an interesting self-guided audio tour of the famed USS Bowfin Submarine. This is the most highly decorated submarine of all time having accounted for 44 kills during World War II. This submarine was launched on December 7, 1942 in an effort to quell the advance of the Japanese navy in the Pacific and you will visit each compartment of this underwater craft. Your tour ends where you started at the Pearl Harbor Visitors Center. This audio tour is available in numerous languages from around the world. The Pearl Harbor USS Arizona Honolulu City Tour is the perfect way to view some of the most important historical sites in the history of the USA. Your five-hour Pearl Harbor tour will start with complimentary pickup at selected hotels and a short ride to the Pearl Harbor Visitors Center. Once at the visitor’s center you will have additional time to explore the rich historical area with no-wait entrance access. Your tour includes special movie footage of the famed Japanese attack, audio equipment for a more in-depth analysis and a short boat ride to the USS Arizona Memorial. After viewing the varying museums within the historical park complex, you will take a short ride through Honolulu City where you will visits sites like the National Memorial Cemetery of the Pacific at Punchbowl, lolani Palace and a statue of the King Kamehameha. Other stops on your tour include the Hawaii State Capitol, Honolulu City Hall and the Kawaiaha’o Church which is considered the Westminster Abbey of the Pacific. Your tour ends with complimentary drop-off service to selected hotels. 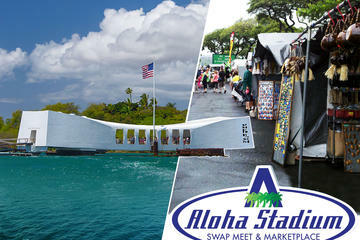 The Pearl Harbor and Flea Market Small Group Tour from Waikiki is ideal for travelers looking for an intimate encounter with one of the most iconic National Memorials in the USA. This six-hour tour will begin with complimentary chauffeured-style vehicle pickup from your Waikiki Beach hotel. You will then travel to the entrance of the Pearl Harbor Visitors Center where you will be given a short orientation and pre-reserved entrance tickets to eliminate waiting times. Once inside your self-guided tour includes a 25 minute video that includes actual footage of the Japanese attack on Pearl Harbor. You will take a short boat ride the USS Arizona Memorial as well as having a chance to experience side exhibits throughout the area. When finished here, you will take a short ride and view some of the historical buildings as well as places in historic Honolulu City where you will have two-hours to explore the Honolulu City Flea Market. Your tour will end with complimentary drop-off service at your Waikiki hotel. The Deluxe Arizona Memorial and Historical City Tour is one of the best ways to experience all history of Pearl Harbor and Honolulu City. Your five-hour Pearl Harbor tour starts with complimentary pickup service at selected Waikiki Beach hotels in a Royal Star vehicle which is equipped with a bathroom, video system and seatbelts. You will at the USS Arizona Memorial Visitors Center with pre-reserved tickets for entrance. You will have ample time to explore this informational center of one of the most important events in USA history. You will also have the option of spending up to two-hours on the USS Missouri Battleship where the peace treaty ending World War II was signed. Once you have finished observing and learning all of the important events of Pearl Harbor, you professional tour guide will drive you through the National Memorial Cemetery at Punchbowl. From there you will be transported with narrative by your guide to standout historical places in Honolulu City like lolani Palace and the statue of King Kamehameha. Your adventure ends with complimentary drop-off service at selected Waikiki hotels. The Day at Pearl Harbor Tour is the perfect choice for travelers that want an in-depth look at the events that took place at Pearl Harbor. 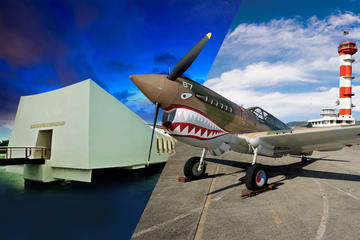 This ten-hour tour will have you exploring the Pacific Historic Park which includes such stunning attractions as the USS Arizona Memorial, the Bowfin Submarine, the USS Missouri Battleship and the Pacific Aviation Museum. With this tour you will enjoy special no-wait access to all of these prime historical sites with audio equipment. You will also have access to no wait movie and shuttle tickets while experiencing one of the most important places in the history of the USA. After you finish with your experience at the Pacific Historical Park, you will travel through the National Memorial Cemetery at Punchbowl, the Hawaiian State Capitol, Iolani Palace and the Westminster Abbey of the Pacific-Kawaiaha’o Church. Your tour ends with complimentary drop-off service to selected hotels. The USS Arizona Memorial and Pacific Aviation Museum Group Tour from Honolulu Port is an exciting and stress free event for guests looking for a VIP treatment. Your six-hour Pearl Harbor tour starts with a timely pickup at Honolulu Port by a qualified chauffeured-style vehicle provided by Royal Hawaiian Limousine. Once at the Visitor Center you will be guided through the process without a wait and given tickets to enter the USS Arizona Memorial at Pearl Harbor. From here your tour will take you to the Pacific Aviation Museum where once again you will enter the museum without a wait and with plenty of information about the museum. The last portion of your tour is highlighted by a drive through downtown Honolulu City where you will visit such sites as the statue of King Kamehameha, Iolani Palace and the State Capitol. Your small group tour ends with a drop-off at the Honolulu Port.